The reference of ghee can be found in Ayurveda, where ghee is not only sacred but has been mentioned as magical too with its curative properties. 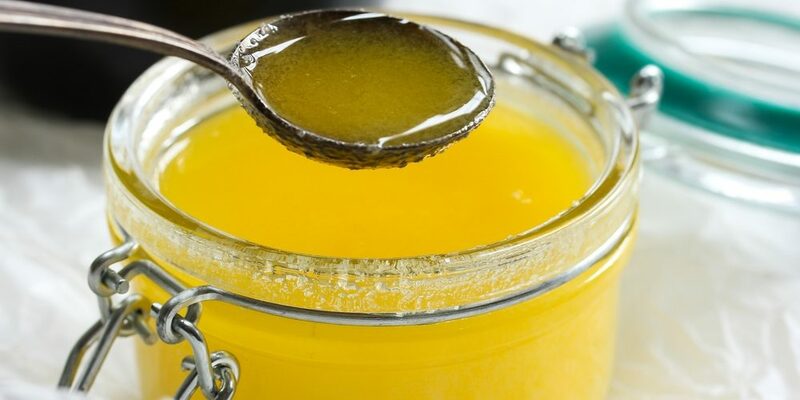 Ghee is said to be curative as it can help in treating ailments. Modern scientific researchers have also shown that ghee is extremely effective in reducing heart diseases. It is considered as a super source of vitamin A, K and butyric acid. It is effective in nourishing our skin, nails and is also beneficial for weight loss. Remember, that ghee should be homemade or organically procured from a desi cow. The negative effects of hormone injections on cows, incorrect fodder and the fact that these cows are not originally desi cows is minimized when one makes ghee at home. It takes 28 litres of full fat milk to make 1kg of ghee. The regular ghee in the market is usually adulterated and has fillers such as flour and therefore quite harmful. One must choose organic or homemade ghee .This article is mainly written with the intention to make the readers aware of the various ways of using ghee in your daily food habit to reap the benefit of this wonder food. Have you ever tried ghee with roti or plain rice? If not, you should try immediately as it is not only tasty but healthy too. Make sure that the rice is hot enough to melt the ghee to blend well with the rice/roti. People of all ages enjoy this. Also note in this connection that ghee is a much more healthy option for preparing parathas than oil or butter. Apart from being tasty, ghee is known to be the taste enhancer with its unique flavor that cannot be attained from any other source of food. A little amount of good quality ghee goes a long way to contribute to a tasty dish. You can make a simple dal flavorful with the help of a spoonful of ghee. Apart from giving the tadka, you can also use ghee to give that finishing touch, if you really want to enjoy the lingering aroma. Many of us little know that preparing desserts with ghee makes all the difference. Such desserts are highly recommended for kids as well as pregnant mothers. Natural food desserts such as ladoos and halwa with nuts, whole grains and dates or liquid molasses taste fabulous with ghee and are healthy for you too. One way of having ghee is one spoon in empty stomach. It has the same effect that we find in oiling the pan before adding batter. It helps to moisten the food pipe and doesn’t let food stick in our system.